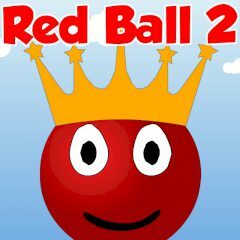 In this funny game your mission is to help the king to find his crown, cause as you know, he can't rule his kingdom without it! Duh! So, if you are able to help him, then start to do it right now and you will be not disappointed! It was a beautiful sunny day in the kingdom. The little Red Ball King was walking outside. But, suddenly the wind came from nowhere and took the crown! What a horrible thing has happened with our king! He is really upset now. He needs your help! Do everything to find his crown as fast as possible! You will face to so many impediments on the way, so be ready for them. Using arrow keys you will cope wit it, no doubt! Throw all your problems away and help this poor king. Beware of precipices, knifes and many other obstacles. You may be sure that you will love this game. Have much fun!